Landscaping may seem like a tiresome, tedious and expensive burden for property managers, especially when nature brings drought and other challenges. Factor in organic, all-natural and green landscaping, and it becomes even more daunting. But, environmental issues are at the forefront of public discussion, and tenants have taken notice. Making your rental property greener can make it more marketable–plus, green landscaping generally requires less upkeep, with lower maintenance costs. Furthermore, a little green landscaping can be beneficial to the environment by reducing contaminants in water runoff and providing a toxin-free environment for humans and animals. And it doesn’t require a hefty investment. The Environmental Protection Agency says that “Maintaining a wide variety of healthy plants, soil organisms, beneficial insects, and animals can keep most pests and diseases in check.” The EPA refers to this as “putting nature to work.” When you restore the natural biological environment, the ecosystem returns to a natural functioning place, where organisms and microorganisms ward off pests and help maintain the nutritious soil. But, how do you restore an ecosystem? 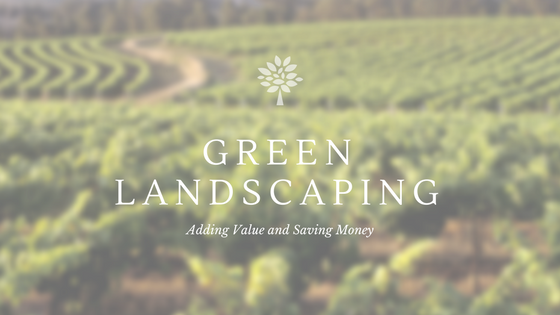 I’ve compiled five inexpensive ways to use green landscaping to make your property more environmentally friendly, lower maintenance, and safer for both family and pets. Standard soil tests measure pH levels and the levels of elements like phosphorous, potassium, calcium and magnesium, among other things. Testing lets you know what your soil needs. Otherwise, the fertilizers and mulch you’re using–some of which are quite expensive–may not be meeting the needs of your yard. There are a variety of soil tests that can be performed at home; otherwise, universities are a great place to seek testing. According to Ohio State University’s Research Area, “Soil testing can boost garden yield and quality. It is a very inexpensive way of maintaining good plant health and maximum plant productivity.” OSU’s Research Area charges $20 for a soil test that can tell a homeowner quite a bit about their ecosystem–and how to create an optimal environment based on their findings. 2) USE GRASS CLIPPINGS AS MULCH. One of the EPA’s four GreenScapes suggestions is to reuse. One way to apply this is by repurposing your grass clippings as mulch. Proper grass cutting suggests you keep grass blades at three inches and leave the grass clippings on your lawn. This limits the ability for weeds to grow. Additionally, grass clippings provide 58 percent of the nutrients your lawn needs. 3) COLLECT RAINWATER–AND USE IT. Each year, American homeowners apply 70 million pounds of pesticides to maintain their lawns. According to the National Audubon Society, much of this usage is solely for aesthetic purposes. Insecticides, herbicides, and fungicides have been linked to a range of illnesses, diseases and birth defects. Furthermore, chemicals can be quite costly. Why not eliminate the use of unnecessary chemicals, allow your yard to nurture itself, and protect communities and wildlife while doing so? Xeriscaping involves creating a landscape that’s in alignment with your local climate and indigenous species. For instance, create a desert environment if you are, in fact, in a natural desert climate like Phoenix. Plant cacti, not a lush grass lawn. Non-indigenous plants, grasses, trees, etc. require far more maintenance and resources, particularly water. It’s far less expensive to maintain natural foliage than non-indigenous species. Overall, the initial investment of going green and restoring a natural environment may be slightly more than synthetic lawn care. But, over time, property managers can save money by eliminating unnecessary water and chemical use. Additionally, a natural lawn is somewhat self-caring, meaning you’ll spend fewer hours maintaining it once it’s been restored. The added knowledge of having a yard that’s better for your community, and safer for pets, wildlife, and your family brings the effort full circle. And best of all, it’ll help attract tenants. Have you undertaken a green initiative in landscaping? What was your experience like? Did you find that the initial investment proved valuable in the end? Has upkeep become easier? Leave us a comment below to tell us what you’ve done with your landscape!